Tom Bennett Sales, General RV Tom Bennett started his career in the RV industry in 2015 with General RV as a trailer salesman. 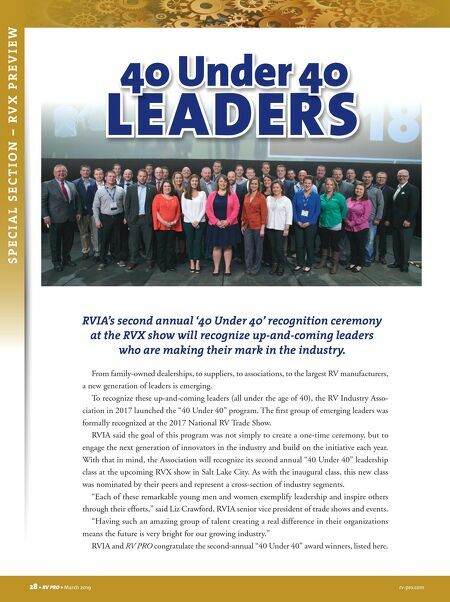 After a few months he was pro- moted to motorhome sales where he was "Rookie of the Year" in his first and General RV's highest producer amongst 13 stores the second. He has worked in many different markets across the country and extensively at RV shows, rallies and events. As a leader among his peers, Bennett shares his knowledge and experience through providing training and personal mentor- ship. With his tenacity for growth and aggressive aspirational pursuit, Bennett says the sky is the limit. rv-pro.com March 2019 • RV PRO • 29 Travis Carr President and Xscapers Co-founder, Escapees RV Club Travis Carr stepped into the Escapees organization in 2010, but his bond has been life-long. After RVing extensively, Carr and his wife, Melanie, founded Xscapers in 2015 in order to bridge a gap in club membership and the RV industry. Xscapers is a community within Escapees created for working-aged RVers. Today, this group makes up 17 percent of the club's 65,000 club members. In 2016, Carr was appointed president of Escapees RV Club and represents the third generation of this family business. His ideas and dedication have continued to advance the club, while providing support for a new generation of RVers. 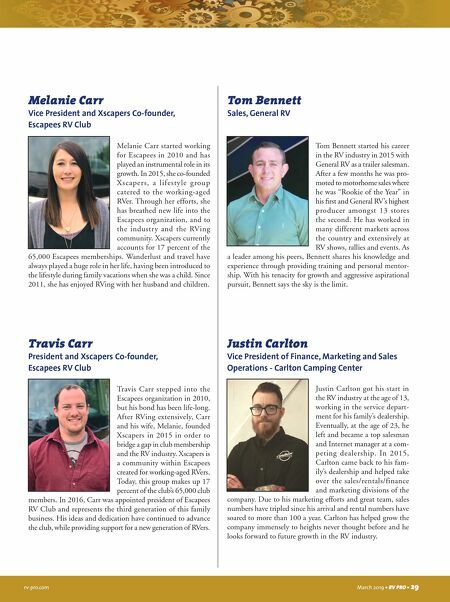 Justin Carlton Vice President of Finance, Marketing and Sales Operations - Carlton Camping Center Justin Carlton got his start in the RV industry at the age of 13, working in the service depart- ment for his family's dealership. Eventually, at the age of 23, he left and became a top salesman and Internet manager at a com- peting dealership. In 2015, Carlton came back to his fam- ily's dealership and helped take over the sales/rentals/finance and marketing divisions of the company. Due to his marketing efforts and great team, sales numbers have tripled since his arrival and rental numbers have soared to more than 100 a year. Carlton has helped grow the company immensely to heights never thought before and he looks forward to future growth in the RV industry. Melanie Carr Vice President and Xscapers Co-founder, Escapees RV Club Melanie Carr started working for Escapees in 2010 and has played an instrumental role in its growth. In 2015, she co-founded Xscapers, a lifestyle group catered to the working-aged RVer. Through her efforts, she has breathed new life into the Escapees organization, and to the industry and the RVing community. Xscapers currently accounts for 17 percent of the 65,000 Escapees memberships. Wanderlust and travel have always played a huge role in her life, having been introduced to the lifestyle during family vacations when she was a child. Since 2011, she has enjoyed RVing with her husband and children.